What I didn’t realize is that Blaklader now offers other simpler pants as well, including a “bantam pant” (which ditches the black patches and is made of lighter, smoother 100% cotton) and a “toughguy painter” which includes just the Cordura knee pockets/reinforcement. And for you freeballers*, they offer a kilt. Really. * I’ve been reliably told that if you wear underwear with a kilt, it’s technically a skirt. Just sayin’. The pants in that picture aren’t available in the US. The “heavy worker” pants here are a little different. If you’re not worried about looking goofy, they’re awesome- I love the nail-apron like utility pockets and the reinforced knee pad slots. I also love light weight foam kneepads in my double-kneed Carhartts, but I wear through those knees while the pants still look new. If you don’t have a Scottish effing accent……..you shouldn’t wear a kilt. On another note, yes to more ergonomic workwear, I just wish it didn’t look so goofy. It has to look appropriate for when I go to the chicken wing place too. 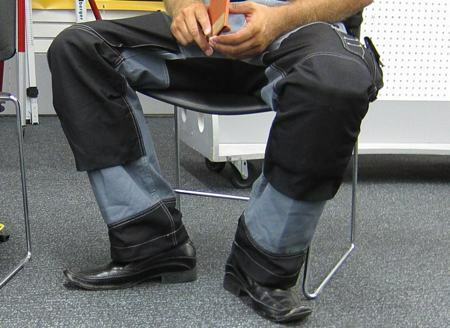 You see pants like this on trade workers all over Sweden. Maybe not denim blue jeans as the base material but they all have reinforced knees, hips, seats and extra pockets. Kinda like extra strength cargo pants. I’d like a pair. Those don’t look like good work shoes though. Can I get those shoes with bells on the toes? I love mine. . . I just wish they came without the black knees/hips/cuffs. That way the Mrs. wouldn’t be so embarrassed when I wear them out in public. Also good on the moto when I don’t want to wear the full riding pants. Those shoes could be good workwear — for Herbie the Dentist. I used to wear Dickies. I switched to Heavy Workers about three years ago and all I can say is these pants are amazing. The material is really really tough. Where I would fray, or wear through three pairs of Dickies a year, two pairs of Blakladers look almost new after three. The most amazing part to me is that the knee pad areas aren’t even frayed. The stitching is quadrupled about every where on them and they are really bulletproof. The only thing that has gone wrong is that one end of one hammer loop has pulled halfway out of where it was sewed into the leg. I think it must have been a defect though cause I don’t really use the loop that much in my work. I wear them everyday as I’m working in some capacity every day. Mine are black on black so they don’t stand out too much. But in public, people are always asking if I am in law enforcement when they get a close up look. These are definitely one piece of equipment that I will never be without for the rest of my life. Now I only wish they made boots. I think you mean Hermey … Funny none-the-less! while i would love a blakladder kilt, i’m quite happy with my utilikilts. their “workman” model predates the blakladder kilt and is absurdly durable. you wear what you want, i’ll wear what i want. Bought a pair of Blakadder a few years ago. They’re really stout. They hold up to serious abuse and use. I’d say even more so than the double-kneed Carhartt that I was buying when they were made in the US.